Spring is also a good time to go fishing in Charleston. 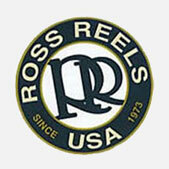 The weather is great, the water is warm and lots of fishing opportunities are available. The sea trout will come out of their winter haunts and begin schooling and feeding during their first spawn of the season. Because the large female trout will feed on mullet and small menhaden to prepare for their spawn, some of the largest trout of the year are caught in the spring. There are many in the 2-5 lb range. We will handle these trout with care and release the larger fish whenever possible so there will be more trout to catch in future years. Biologists tell us one female trout can have several hundred thousand eggs in a spawn which will have a huge impact on our trout stocks. We will probably use either live bait with a popping cork or Carolina rigs or artificial lures with a popping cork to target the sea trout. We can catch nice red fish and flounder this way, too. Spring is also when several of the seasonal migrating fish appear in the warmer waters of the Charleston area. Cobia should be moving along the beach and near shore areas on their migration north. We can also find schools of Spanish and king mackerel, amberjacks, jack crevalle, bluefish, ladyfish and pompano working their way north. These fish may be just off the beach or working their way into the Charleston harbor. Seagulls will be diving over the schools of fish, and the fish will be busting on the surface! This is really exciting to watch and provides for some awesome fishing. 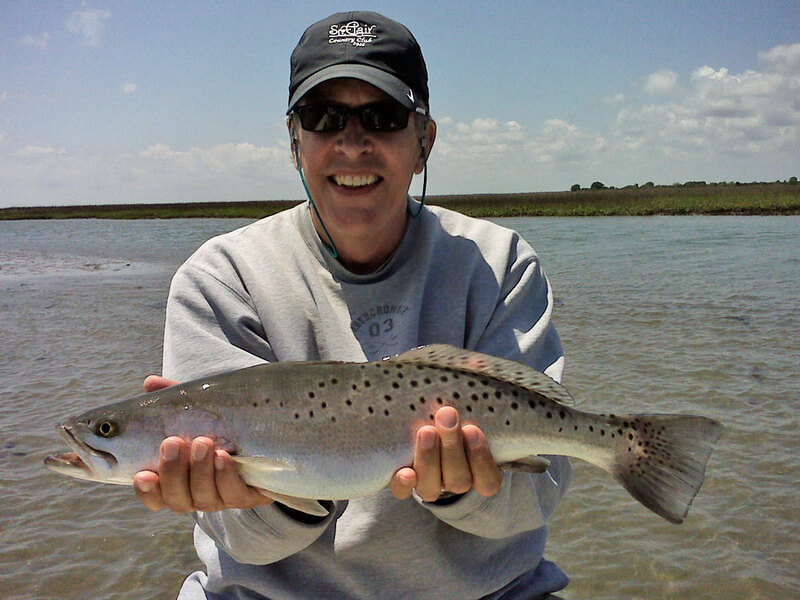 Overall, spring is an excellent time to get out and enjoy the low country from the water. The weather will be warm and beautiful, and the fishing will be really enjoyable. 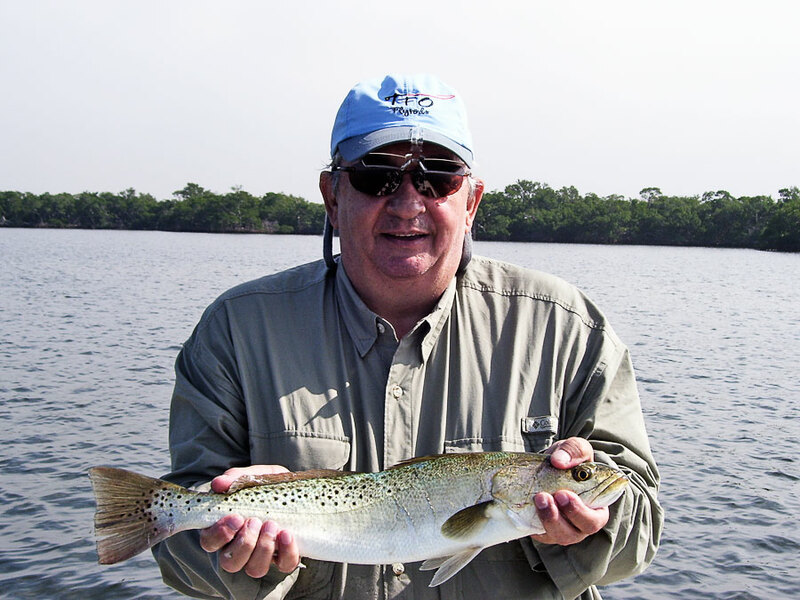 Summer offers a wide variety of sight fishing opportunities. 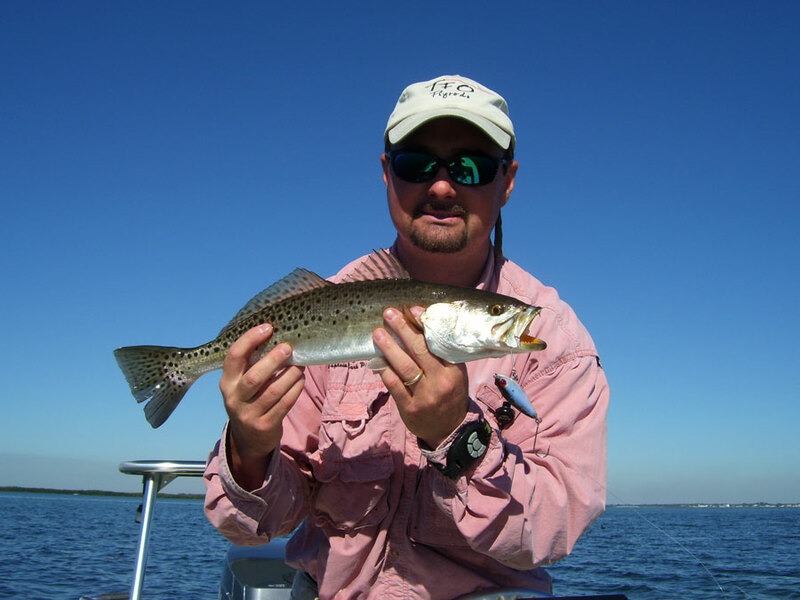 We can fish the flats and the creeks for redfish, trout, and flounder. The harbor carries schools of Spanish mackerel, bluefish, and ladyfish. In addition, schools of very large jack crevelles appear in the harbor. In fact, a world record jack crevelle was caught on the fly right here. Another option during summer is bottom fishing. Several species can be caught along the harbor jetties, off the beaches in the surf, and elsewhere up and down the coast. 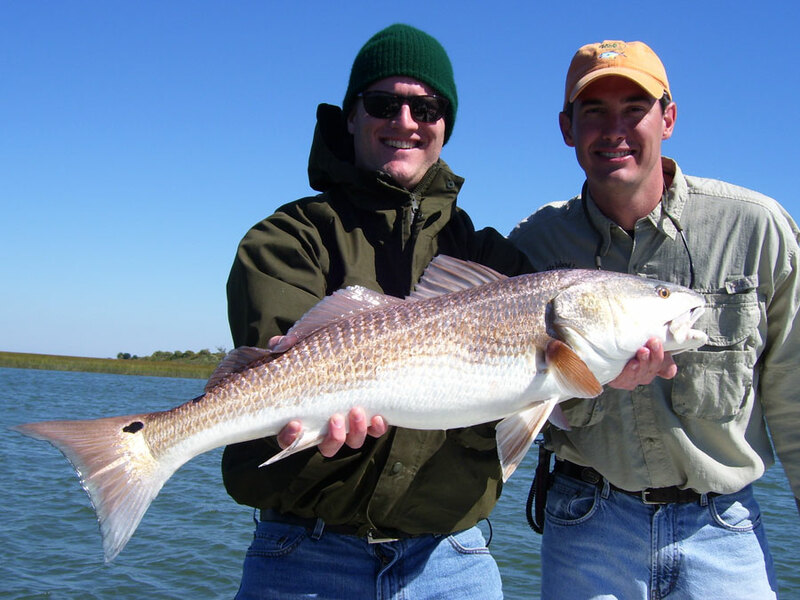 For example, big bull redfish up to 50 pounds can be caught. Also, we frequently catch several types of sharks, including black tips, spinners, Atlantic sharpnose, bonnet heads, hammer heads, lemons, and bulls. When conditions are right, it is possible to catch sharks on the fly. Finally, tarpon fishing is available during the summer. While tarpon are not as common here as in Florida, there are several that are caught each year. This is not always a consistent fishery but can provide a nice surprise from time to time, and the tarpon here are rarely under 100 pounds. Some years are better than others—I have jumped as many as six tarpon in one day here. From May to October each year we target “tailing redfish” During the warmer months of the year around the full and new moons we get above average high tides. 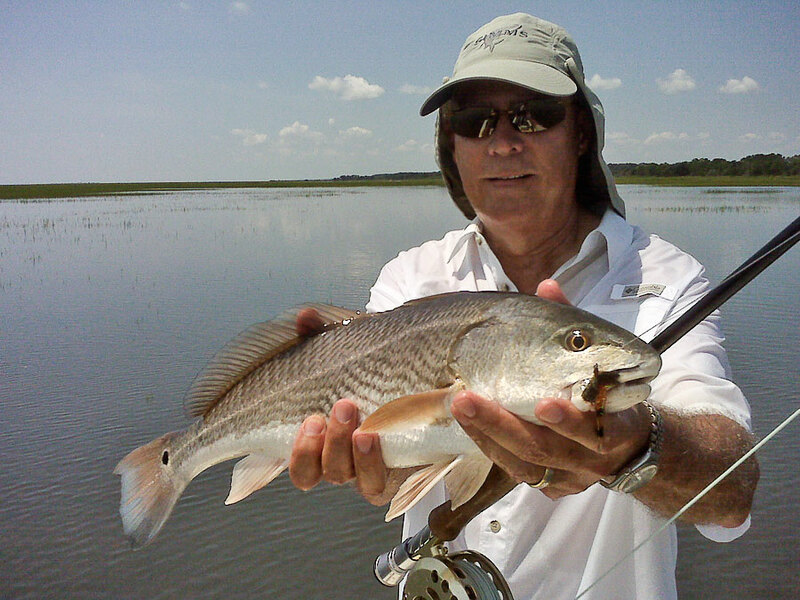 These high tides allow redfish to go very shallow into the flooded grass flats to eat crabs. This is sight fishing at its best. 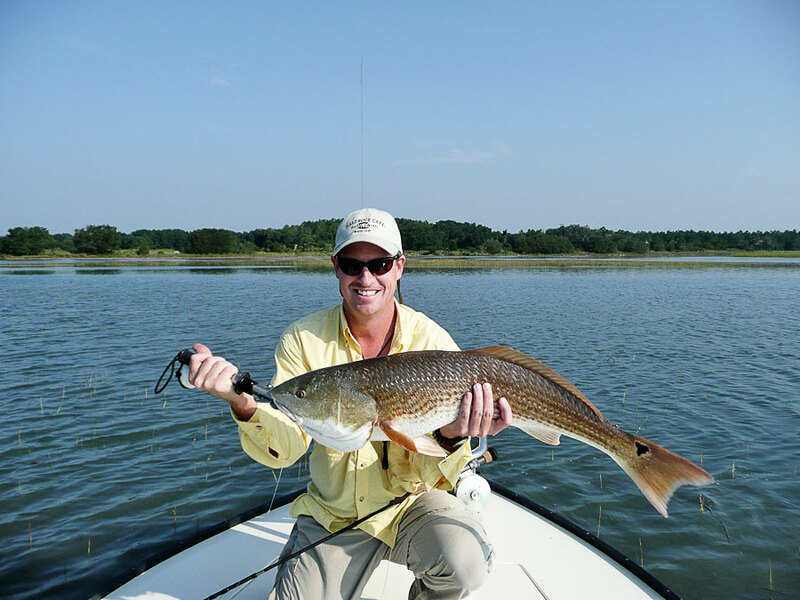 Redfish up to 35 inches, weighing 15 pounds, can be found in a few inches of water. This is a favorite way of fishing for redfish because it’s completely visual.You will actually see the redfish stick his entire tail out of the water while he is feeding on the crabs in the grass. If you are looking for this type of trip you should ask specifically for a day when we have an above average high tide. There are typically only 5 to 10 days a month during which this is an option, but it is well worth the wait. If you are interested, this would also be an excellent time for wade fishing. The fall is probably my favorite time of year in the low country. This time of year brings cooler weather and less humidity. Charleston natives enjoy oyster roasts, baiting for shrimp, and eating delicious Frogmore stew during this time of year. If you are in the area, definitely take advantage of the great fresh local seafood restaurants serve this time of year. Fall is also my favorite time of year for fishing here. This is the peak season for redfish, sea trout, and flounder because they are literally gorging themselves in preparation for the winter—this is an angler’s dream. The cooler water has all the mullet and shrimp thinking about migrating to the ocean for the winter. That means the bait will be in great numbers and on the move. This causes redfish and sea trout as well as flounder to eat more and more often each day. Not only is the weather nice enough to stay out fishing all day, but also the fish seem to feed all day. Redfish will start forming into schools working the bait as they try to escape. You can find redfish by watching the gulls that hover over the redfish schools hoping for an easy meal. 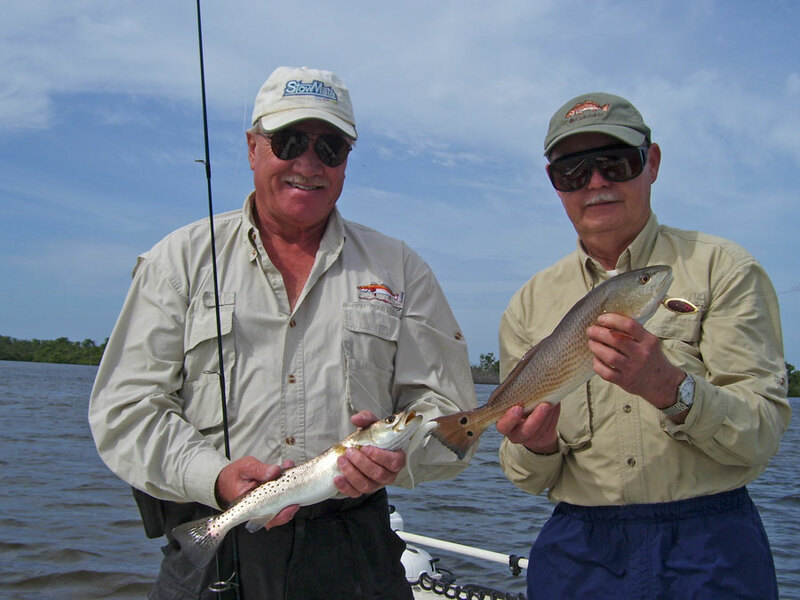 The redfish will bunch up the bait and attack at will. During this time the bait will jump out of the water and the gulls will dive into the water for an easy meal. When the redfish are in this kind of frenzy they will eat almost anything you put in their face. Of course a live finger mullet or shrimp will get eaten; however, I love to throw artificial lures and flies during this time. On a good fall day, we can catch up to 100 redfish. Winter is the best time to find redfish in large schools. That means great sight fishing for redfish on the flats in and around the Charleston area. The redfish are in large schools of 100-200 fish per school. During especially cold winters, I have seen schools of up to 500 fish. These fish can be found in shallow warmer water, and since the water is really clear, we are able to see the fish very well. I typically look for calm, warm days when the tide is low in the mid-morning or early afternoon. 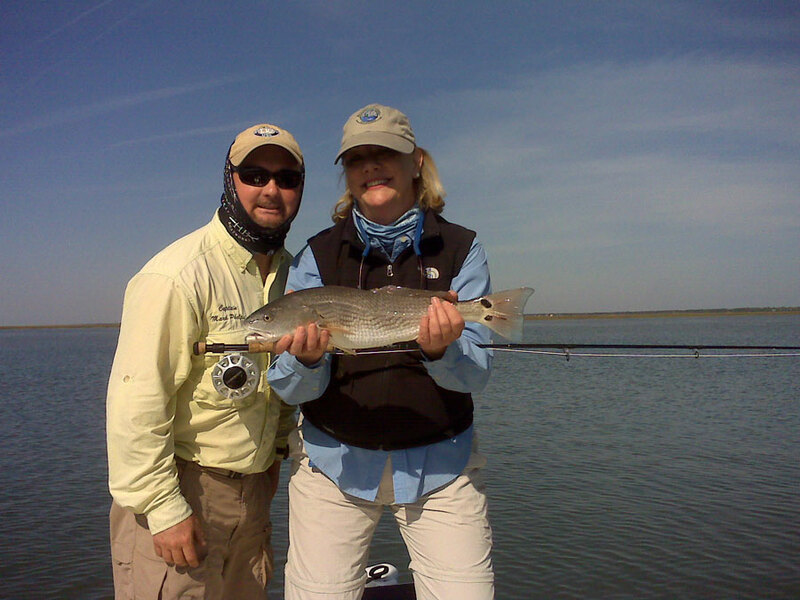 The warmer water draws the redfish to the very shallow areas and also puts them in the mood to eat something. Sometimes the fish eat right away, and other times we have to be patient and wait for the tide to change or for the water to warm up a little—then we often catch fish every cast! Sometimes the large schools of fish can spook easily, so we have to be very quiet when approaching the school and make long casts to the fish so as not to spook them. Also, the cold water sometimes slows the fish down, so we have to work the bait or fly very slowly to give the fish time to eat it. The result of this quiet, slow method is a nice peaceful time fishing in the beautiful shallows and the reward is catching some gorgeous fish. If we can find the right conditions, we will have a great day sight fishing. As another option, in late winter, there is a big run of American shad that move up the rivers before entering the freshwater lakes for summer. The American shad is an excellent light tackle/fly fishing experience. These fish average 2 to 5 lb and are fun to catch.